As I’ve written in the past on this blog, it’s illegal to post signs on poles used for electrical wiring. The metal staples can be a hazard in many ways to the workers on the poles. It’s hard to tear down a lost dog poster. I feel so sorry for the dog roaming around on West End Avenue among speeding cars, trucks and buses. Dogs are so vulnerable. And trusting. I noticed the next day that the Rutledge sign had blown away to become litter somewhere else. 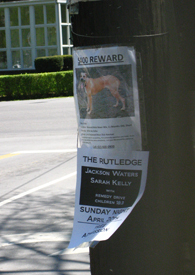 Unfortunately, the lost dog poster was still there. I often wonder how some litter gets where it does, when I find it. 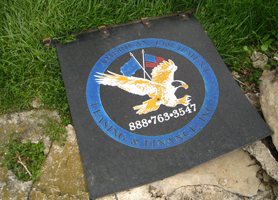 This sign for American Equipment Leasing and Finance was discovered on the rock wall along West End Avenue. At first, I thought that it was a real estate sign. But the company being advertised leases semi trucks to owner/operators. Here’s the top and the bottom of what I found today on the sidewalk along West End Avenue in front of an office building where a U.S. Senator has his local office. I saw this fabric on the sidewalk and got as close as I thought was safe. I’m not sure how this litter got here, but you can guarantee that I left it (them?) there. A coworker remarked that they were not Bill Clinton’s because he wears briefs. I’m not sure how he knew that! Litter or Food for Ants? 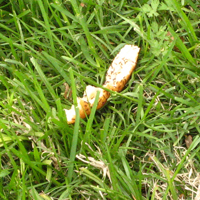 This pizza crust doesn’t bother me too much as litter. When I found it in the grass along West End Avenue, ants were picnicking on it. Generally, we should never feed wild animals, as they learn to be dependent upon humans for food. Humans are not dependable food sources. If the pizza crust was nestled in a styrofoam container, that definitely would be litter. When I drove into my driveway tonight, this NOTICE was taped to my mailbox. 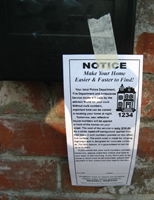 It is not legal to put unpaid flyers on a US mailbox. We also have a no solicitations sign posted at the entrance of our subdivision. This notice is written as if the authorities authorized it. The notice uses the fear tactic, too. Without the large painted numbers on the curb in front of your house, the police and fire departments cannot find you at night in case of an emergency. The guy posting the sign, Russell Norton, will take cash or checks to paint the numbers on the street. If you don’t want to be bothered, just leave the $10 to paint the numbers taped to your front door. It’s a scam. 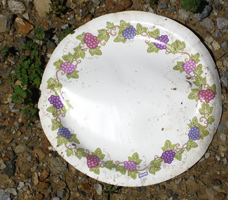 This litter will be scattered all over the neighborhood in the morning, when I take my walk.